Sundays with Crissy ~ Relish to Embellish – My Cardz ~ My Passion . . .
Good morning! I hope you are having a relaxing and enjoyable weekend. It’s time for a new challenge at Sundays with Crissy, yay! This time our challenge is titled Relish to Embellish. I love that Crissy always puts a poetic twist to her challenges. I definitely had fun with this one … once you get started, there’s no stopping! This gorgeous image is called He loves me and is available as a digi image from Wags ‘n Whiskers, beautifully illustrated of course by Crissy Armstrong. The DP used is from the Basic Grey green at heart 6×6 paper pad and the sentiment is computer generated using the Scriptina font from dafont.com. As for embellishments, here’s my list! The flowers are pre-made from K&Co – I added the centers using circles cut from the dp and painted the center petals with Smooch paint in moonlight (one of my favorite embellies); The flowers on the digi image are also painted with moonlight Smooch; I’ve used some Diamond Stickles around all the edges of the rust colored cardstock for a look of glittered paper; Added some white Zva Creative self-adhesive pearls and a polka-dot orange ribbon from my stash. I think that’s it! I hope you will join us for this challenge – EVERYone loves to add embellishments to their cards . . . primas, ribbons, glitter, buttons, brads, any and everything! And, don’t forget, you have TWO weeks to complete your project. For some AMAZING inspiration on this challenge, you MUST stop over at the Sundays with Crissy challenge blog. I know you’ll be blown away by the DT samples! I feel so honored to be working with such a SUPER talented group of ladies. On a side note, have you heard about the new service being offered by Ann Vento of Raindrop Echo Designs through Whimsy Stamps? There is an awesome selection available with a VERY quick turnaround! All the details can be found here. Thank you for visiting today. Hope you can stop back for a new House Mouse Monday tomorrow, along with the announcement of the winners from our blog hop. « Just arrived . 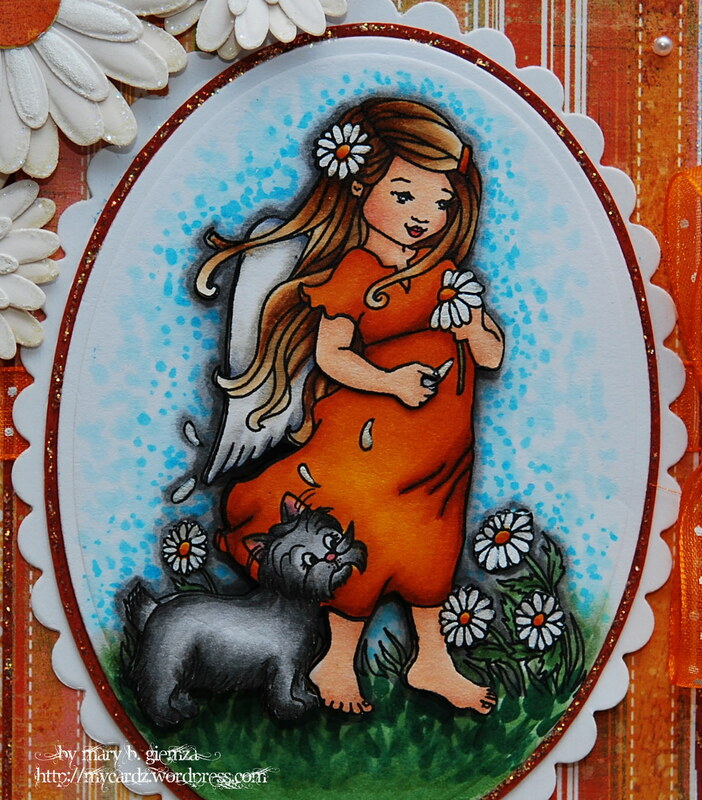 . .
Wow, I love how you continued the theme of daisies throughout the whole card! From image to dp to floral embellishments! Those daisies are stunning! Super gorgeous colouring, as always Mary! Thanks for posting this beauty! How beautiful! Love the warmth of the oranges!! Gorgeous card! Hey there Mary!!! Your card is absolutely gorgeous!!!! I love the LO and your colouring–WOW!!!! Love those daisies too–they are perfect with your pretty BG paper!! Awesome card Mary, your coloring is Outstanding, love the puppy and the Daisys are beautiful!! Enjoy the weekend!! Mary this is beautiful! I love your shading! Just gorgeously colored! love the polka dottieees around this image…you always get it just right! Just beautiful Mary!! I love the coloring of course!! But those punched flowers are just gorgeous too! Wow Mary, this is absolutely GORGEOUS!! I love love love all of your work! Thanks for sharing the post with us. This is not only interesting but its simply Great!